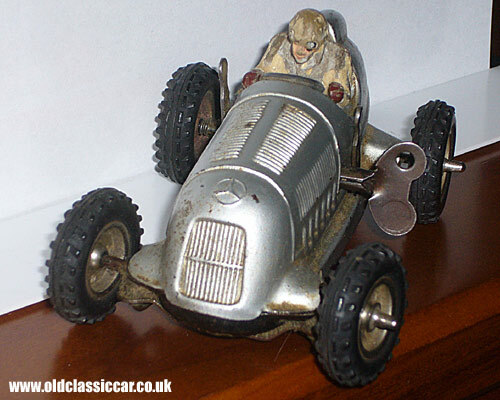 Less easy to find than the similar Schuco toy Mercedes, is this one shown here by Gescha. 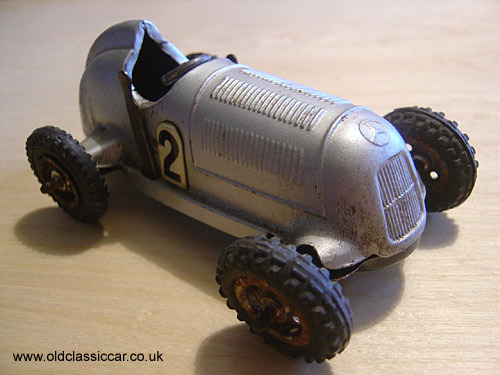 Slightly smaller than the Schuco, the Gescha version of the 1930s Merc racing car is a cracking little toy, and this one has survived really well. It is powered by a clock work motor and has operational steering. There are 2 levers, one engages and disengages the drive, and the other (I think) switches between high and low gears. It also comes with a quick-lift jack for pitstop tyre changes! The final photo shown above is of a Gescha Mercedes Benz, with driver, belonging to Lloyd in Australia. "I have one of these cars. It looks identical to that shown by you on your site. 1 to disengage the mechanism, presumably so the car can free wheel to enable it it be played with without its mechanics engaged. 2 as a brake on the mechanism. 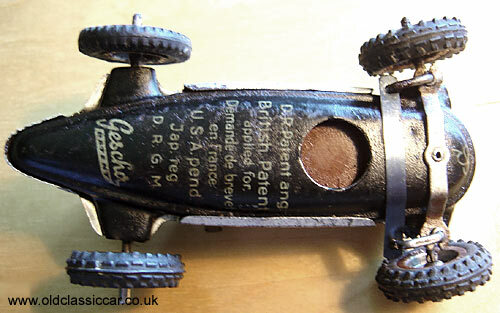 This enables the car clockwork motor to be wound and released at will. It also stops the car from moving. The wheels are (or were) retained by a friction grip wheel cap. These caps have long been lost - unfortunately. But before they were lost wheels could be changed. It has a rack type steering mechanism but this can only be set (for example in a large circle) before releasing the car. The steering wheel in the cockpit was decorative (although it could be turned). Unfortunately this is also now lost. A feature which you do not mention is that it has a diaphragm on its base and this is beaten by two hammers when the clockwork mechanism is run (with or without the transmission being engaged). It makes a noise not unlike a real racing car - with a bit of imagination." Thanks for the extra information John, I hadn't realised that the diaphragm in the baseplate was there to create engine sounds! I've added in three new photos, including one showing the toy's baseplate and another showing the quicklift jack system. 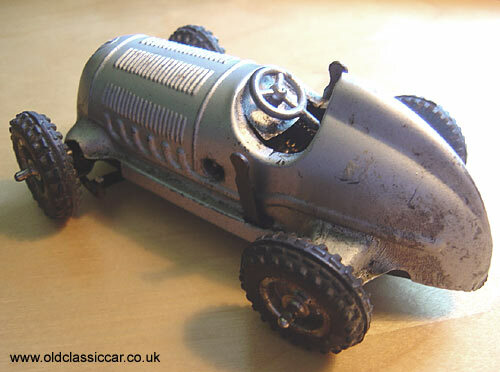 The latter represents the type of jack often used to lift single seater competition cars in the 1930s, the idea was the engine would be run up, in gear, with the back wheels spinning in order to, I believe, warm up the oil in a pre-selector gearbox. 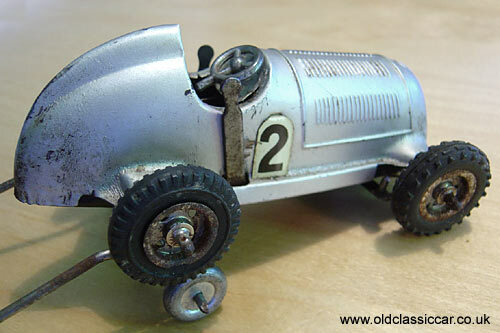 Colour: silver with black base, wind-up clockwork motor and steering mechanism.